9LED Flashlight - $ 6.95 ea. - SUPER VALUE !! Includes batteries & lanyard. Length = about 4". 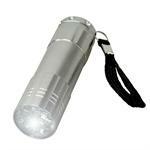 Has 9 bright LEDs in strong lightweight aluminum alloy housing. Push button on back end to turn on/off. 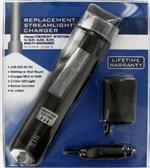 Includes 3 x AAA Alkaline batteries & lanyard. LED Tactical FLASHLIGHT - Super bright, 250 lumens. Includes batteries ! Tactical Hi-Watt LED Flashlight. Brightness up to 200 lumens ! 3 modes: Bright, Intense, Strobe. Includes Batteries ! (Runs on 3 x AAA Alkalines). Long-lasting - up to 5 hours continuous on 3xAAA. Impact resistant alloy design. Includes lanyard. 21-LED-Headlamp: Super bright LED headlamp. Runs on 3xAAA batteries (included!). Has 4 modes: 1LED, 8LED, 21LED, Strobe - easily accessed by 1 pushbutton. Has adjustable headstrap, and has pivoting direction head. 350 Lumen LED Tactical flashlight - ready to use. Duracell Durabeam Ultra. Has 2 brightness modes. Has focusing Beam. Runs on 4xAAA alkaline batteries (included). Heavy-duty aluminum alloy construction. Length approx. 5". SL-20 : 6.0 volt 2500mAh rechargeable Heavy-Duty Ni-Cd rechargeable battery stick for Streamlight & Maglight flashlights. Replaces SL20, SL-20, FLB-NCD-4, etc. Size: 7.25" long x 1" dia. What exactly is a "lumen" ? It is a measure of the total amount of visible light emitted by a source. by dividing the number of Lumens by 12.57 .